Never before has there been so much interest in equity derivatives-or so much innovation in structuring these products. As new forms of instruments proliferate, their complexity has grown as well. Even equity derivatives professionals are unlikely to know all the details about every existing structure. With equity derivatives comprising one of the most important components of the capital markets, it's more crucial than ever for every financial professional, specialist and nonspecialist alike, to understand how derivative instruments behave, how they're structured, and how to use them profitably. J. Gregg Whittaker, and Fischer Black outline the full range of the equity derivatives market, from classic warrants, options, and futures to the new and innovative PERCs, equity swaps, and equity-linked bonds. 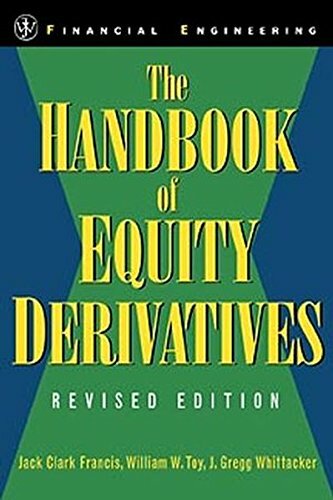 Whether you're a finance student becoming familiar with the field or a practicing professional seeking better ways to exploit the tremendous potential of equity derivatives for profit, The Handbook of Equity Derivatives, Revised Edition belongs on your bookshelf. If you have any questions about this product by Jack Clark Francis, contact us by completing and submitting the form below. If you are looking for a specif part number, please include it with your message.